When you click on the Properties tab at the top of your screen, you will see a yellow bar beneath the top level tabs that reads View Properties for Asset Type (as shown below). It is important to understand how this bar works, as it operates a bit differently than you might expect. You can filter the properties displayed by selecting one Asset Type from this list. For instance, if you select Short Sale, the list will display only Short Sale properties. You will notice that when you do this, the sub tabs shown at left (Search, New, etc.) will also change, which impacts which properties you can view. This is due to how your property statuses have been set up. If you elect to view properties for an Asset Type of Short Sale, the sub tabs that display at left will only be those that use an Asset Type compatible with Short Sale (see our sample below). Our system is set up such that the Asset Type of Listed can be used for ALL Asset Types, therefore, this status option would show at left for Short Sale properties, as well as for any other type of property. Because we do not have any other statuses set up to be used with Short Sales, the only three status options that display at left are Search and New (which by default will display for all properties), and Listed, which we set up to show for all properties as well. If we had created an additional status to be used for Short Sale properties, we would also see that status at left. Once you change the Asset Type in the yellow bar, it will stay that way until you run another filter. 1. Select the desired Asset Type from the View Properties for Asset Type field in the yellow bar (in our example below, we selected Short Sale). 2. Click the Search option from the Side Navigation Bar on the left side of the screen. 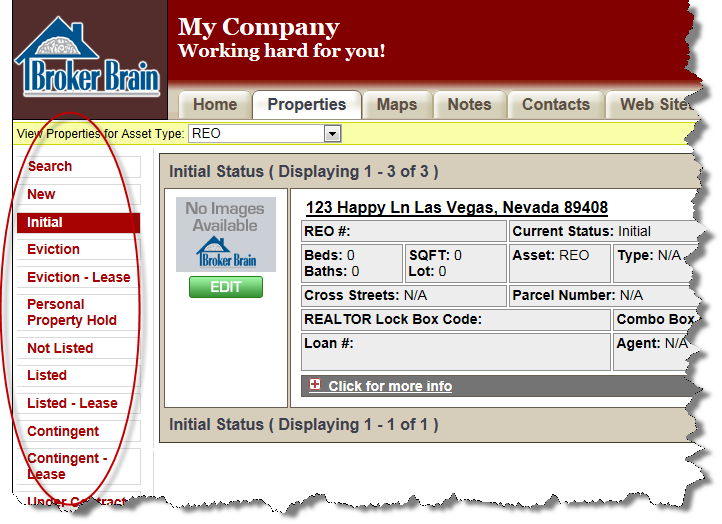 The Property Search screen shown below will appear. 3. In the Property Status section at right, select the statuses you wish to view. 4. Click the green Search button at the bottom of the screen.